Ugly. Ugly. Ugly. | Spaceship! Spaceship! Spaceship! Cole Blaq is one of those builders whose work boggles the mind on every occasion, so when he turns his attention to a Star Wars mashup you know it’s going to be something special. Apparently this product of bodging different ships together is known as an “ugly” but Cole’s X2BTy is strangely beautiful. Top marks for his oh-s0-simple solution to the T-shaped vanes in the X-Wing air intakes, which have vexed builders for years. 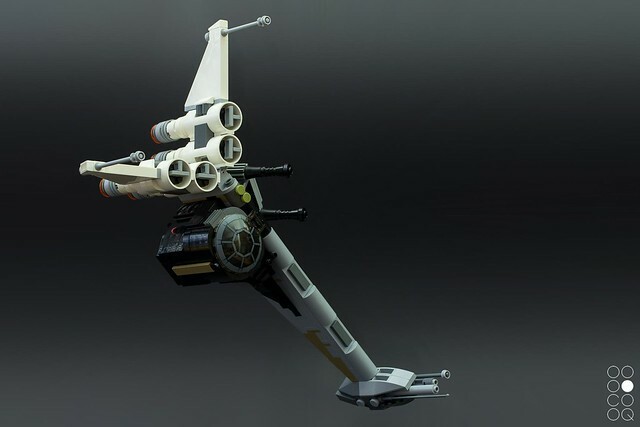 Shame this can’t be used in an official LEGO set, since it’s an “illegal” technique. There’s more pics of this model in BLOCKS magazine issue 22. This entry was tagged MOC, star wars, swooshable. Bookmark the permalink.